Recently (and by recent, I mean a month ago), I purchased the Majolica Majorca Puff de Cheek blush in Raspberry Macaroon PK415. So, Instead of featuring one Puff de Cheek, I've decided to post swatches of my entire Puff de Cheek blush collection. 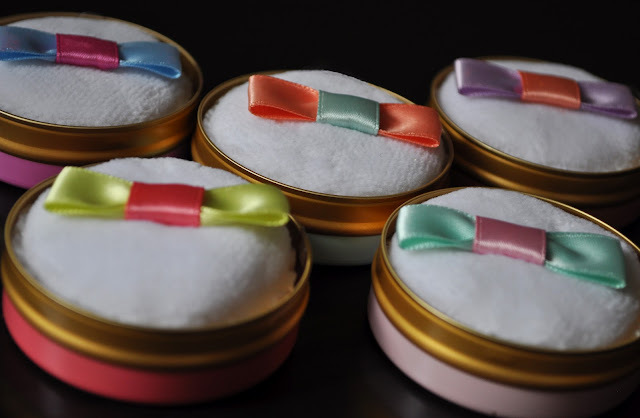 Each blush comes with a cute, fluffy puff with a bow matching the exterior packaging. I love the adorable tin casing of these blushers. The Packaging is cute, feminine, and in my opinion, has a vintage feel to them...with a modern twist of course. 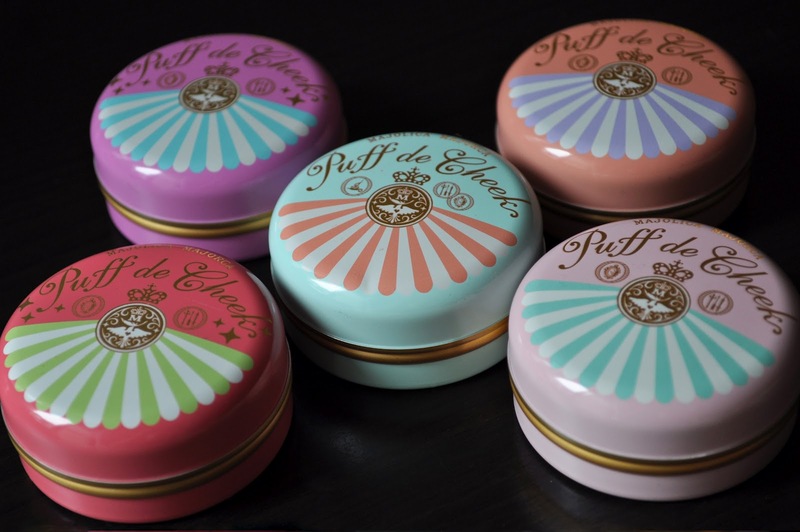 The Majolica Majorca Puff de Cheek blushes contain 7g of product and retail for ¥1,399 ($17.66). From left to right: Vanilla Macaroon 82, Peach Macaroon PK301, Apricot Macaroon OR302, Cherry Macaroon RD414, Raspberry Macaroon PK415. Vanilla Macaroon 82 (Limited Edition): a beautiful, subtle vanilla sheen that can be used as a highlighter, all over face powder, or layered over other blushers. The following four blushers have a matte finish with a subtle sheen, except Raspberry Macaroon PK415, that contains silver sparkles. Peach Macaroon PK301: a pale peachy-pink. Apricot Macaroon OR302: a pale creamsicle orange. Cherry Macaron RD414: a bright cherry coral. Raspberry Macaroon PK415: a bright raspberry pink with silver sparkles. The Majolica Majorca Puff de Cheek blushes offer great pigmentation, and are smooth in texture. The tin casing makes them easy to travel with. I really like these blushers, and they are a fun addition to my blush family. Have you tried any of the Majolica Majorca Puff de Cheeks? I love the packaging! The little puffs are to die for! haha... 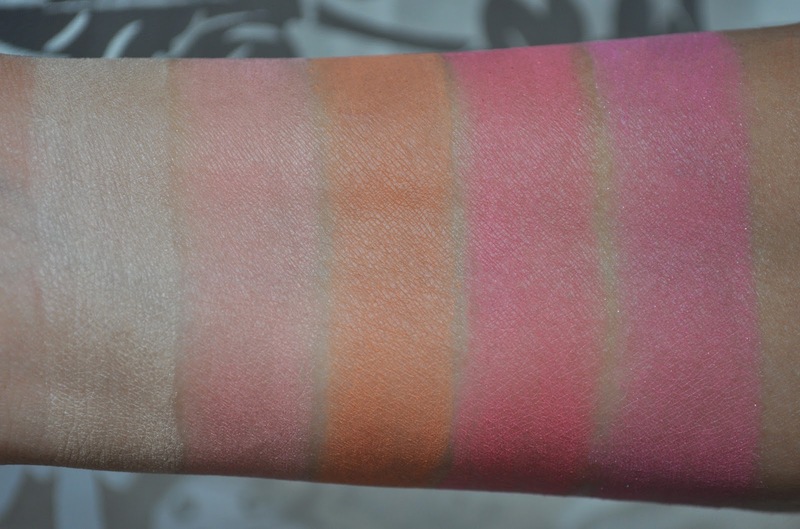 I am drawn to blushes and these look just so lovely! When I last saw them they didn't look that impressive. Must have stepped up their quality! I know, the packaging is soooo cute! 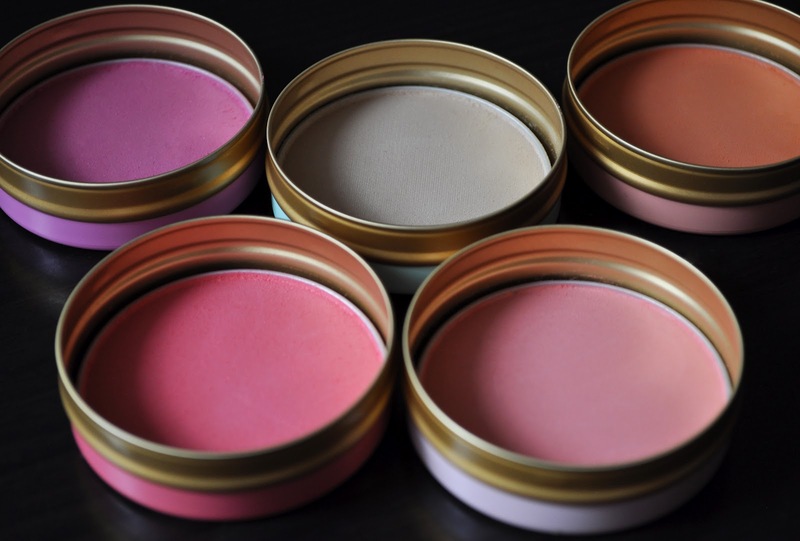 Do you have these blushes at the Asia markets over there? Really, I find them easy to throw in my bag, but I guess it depends on what kind of bag your carrying. How much are these blushes over there? I had only ordered the bright pink blush so I see I'll need to change that to include the other one too:)) As the SUQQU stock is only available at Selfriges end August I will wait on your post to decide on the Ex-07. You're a real sweetie offering to help with picking up things over there but I HATE it when my stuff gets stuck with customs & if I order from Selfridges the shipping is high but it gets here FAST with no nasty import taxes. If you ever want anything from here (which I can't imagine because I feel like we -Germany - are the LAST to get every collection ) then just let me know OK? Sorry for the late reply Buggsiebee!! you definitely need to add the beige blush to your order. I should have the Suqqu post up next week. Hi! Where can I find this in Tokyo? I want to ask my Kareshi to buy me these but I'm afraid he doesn't know anything about this cute make-up of course! Haha! Do you have any recommended shop I could advise him? Thanks for your post!